I has been announced that the 2014 Incoherent Scatter Radar School will be held at the Arecibo Radio Observatory in Puerto Rico. This will be a joint event between the European and United States radar communities. 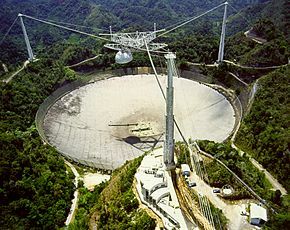 The Arecibo Radio Telescope is a most distinctive facility, owing to its unusual design and huge size. It is build into the landscape, using the natural shape of the terrain to assist in the forming of the main reflector. This is fixed, and provides a limited view of the sky overhead. However a moveable gregorian secondary focus allows some degree of flexibility. That, and the earth's natural rotation, allow it to observe a narrow band of the sky between Declinations -1 and +38 degrees. It is also extremely large. The 305-metre diameter means a total collecting area of 73,000 square metres... this holds the record for the largest physical size of any radio receiving system ever since its completion in 1963. And although it will be exceeded in the near future by other telescopes that are under construction (e.g. when finished, the LOFAR HBA will be 76,000 m2 and FAST will be 196,000 m2) and those that are planned (such as SKA and KARST), the Arecibo Radio Telescope will remain an important and powerful scientific instrument for many years to come.